Lately, I bought a Cisco 3550 switch with 48 ports. My goal was to have a switch that could do the inter-vlan routing instead of relying on the router. This way, if my router goes down, I only lose my internet connection but the voice network and data network on my LAN can still function properly. I was also using the cisco router as my DHCP server, but now it is running on my switch. The first thing that needs to be configured is the SVI interface. SVI stands for Switch Virtual Interface. It represents a interface to a vlan. You need one SVI for each VLAN that you want to provide routing on. By creating an SVI, you assign it an IP address. This IP address is the address that you will use as the default gateway on all nodes on your VLAN. Since I wanna host my DHCP server on the switch now instead of the router, I can take the same configuration I had on the router at apply it on the switch. Notice that the DNS server (forwarder) is on the router and not on the switch. Usually, the DNS server in my setups was on the same device as the subnet's gateway. So on all the devices that were assigned a static IP on my network, I had to change the IP address of the DNS server. There are two ways of doing this: SVI or routed port. With this method, I would create a VLAN 10 on my switch for subnet 192.168.10.0/24. 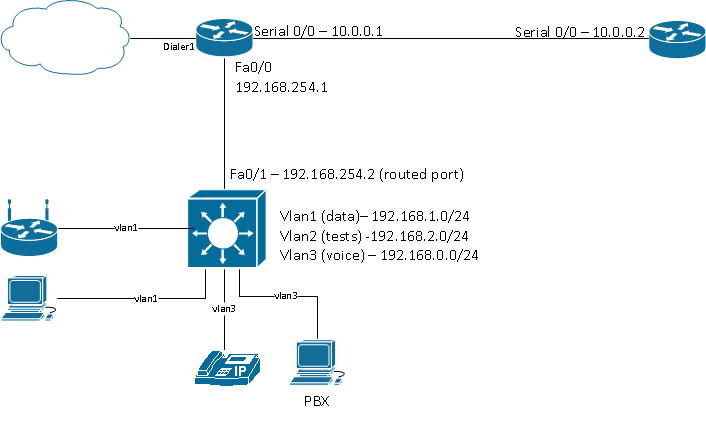 I would assign an IP address from that subnet to my router's LAN interface and connect it to an access port that is part of VLAN 10 on the switch.